The majority of most forms may be found within the first bulleted item below titled “FORMS” and National BSA provides National forms HERE and District and Unit Resources by clicking HERE. Please visit our Council Calendar . Full listing of all Council sponsored events and activities exist here. An event flyer, when made available, would be found within the “Resource” tab of any calendar event. OR check the Community Bulletin Board Page for additional event flyers. The Community Bulletin Board is intended for the posting of public events and messages, or announcements that may provide information for the local Scouting community to consider. Finally, use the “Site Search” Tool found on the upper right on any page as the ultimate resource tool. For example, if you type the word “Venturing” you may find a results page listing all the event and news articles, PDF flyers, and/or calendar event registrations that contain that word. 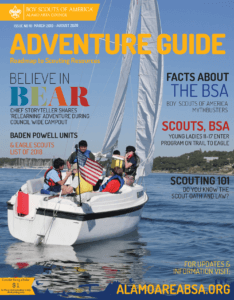 National BSA also has a resource page on Scouting language that can be found by clicking HERE.